HDD Low Level Format Tool for Windows 10 - A tool to destroy information on drives of any type. The application can work through the supported Windows interfaces, handles non-standard formats of memory cards connected via card readers, includes Ultra-DMA mode and the function of programmatically changing the actual volume of the device. Provides complete, non-returnable erasure of data, zeroing of MDR and logical volume tables, performs all procedures taking into account the values of SMART monitor indicators. The application creates space in the NTFS system and with the specification of the standard cluster size. 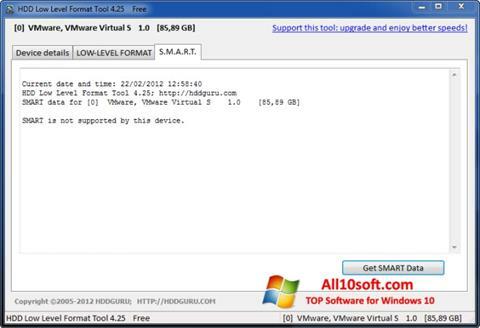 You can free download HDD Low Level Format Tool official latest version for Windows 10 in English.